Info "An easier way to steal a heart." Heartwrench is one of Dr. Crygor's microgames in WarioWare: Twisted! The player controls a crane. The game's purpose is to use it to grab the heart. 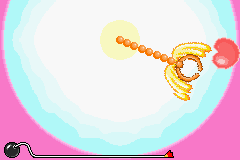 To do so, the player has to move it until it is right above the heart, and press the button to grab it. If done so, the game is won. However, if the crane hits the ground, it breaks and the player loses. 1st level difficulty: The crane is big. 2nd level difficulty: The crane is a bit shorter. 3rd level difficulty: The crane is short. This page was last edited on October 1, 2018, at 16:13.